My Spicy Sausage and Mango Grilled Cheese Sandwich recipe is a delicious combination of flavors that takes the standard grilled cheese sandwich up a notch! While I was born and raised in Southern California, there was a short period of time that my family and I lived in Oregon. While we lived there, I have memories of eating at a small drive-in restaurant that was built from a single-wide trailer. The only food I remember eating there was a fried hot dog sandwich. The best I can recall is that it was a hot dog, sliced down the length of the hot dog, but not all the way through. Just enough was left uncut so that the hot dog was able to be opened and laid flat and cooked on the flattop. I remember it being sandwiched between two slices of plain white bread, nothing fancy. While I don’t have a desire to have that fried hot dog sandwich today, the memories of that sandwich have been strong even after all these years. It brings good memories, of being with my mom and dad and my siblings. A time I wish I could go back to, just once more. The inspiration for my Spicy Sausage and Mango Grilled Cheese Sandwich comes directly from those hot dog sandwich memories. Rather than a cheap and skinny hot dog, my new sandwich uses a spicy chicken sausage. Rather than white bread, I’ve opted for a hearty sandwich roll. 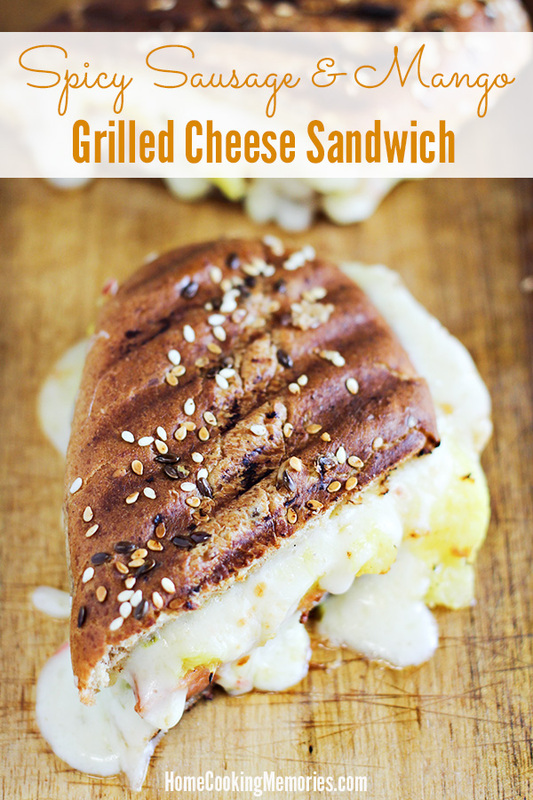 And then there is the mango and the pepper jack cheese — well, those are added because they are perfect in this sandwich and quite delicious. 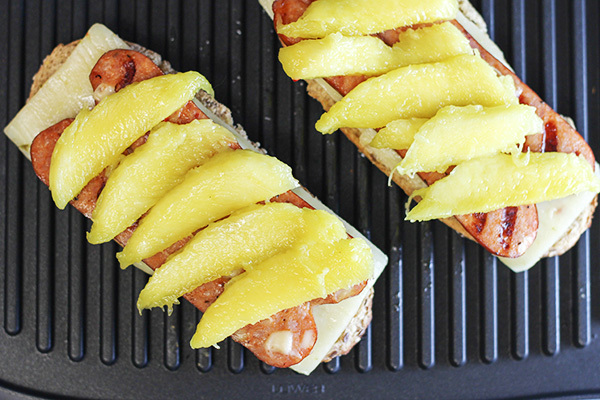 While the sausages play an important roll in this sandwich, the mango is what makes it. I’ve only been eating mangoes for a short time. In 2010, I used mangoes in a guacamole recipe, after years of thinking I didn’t like them. 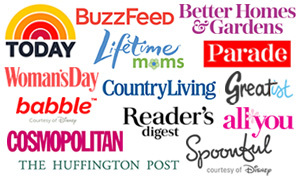 I learned that I actually do like them and have used them in several recipes since. My least favorite part, though, was cutting them open to get the fruit. Sure, I could do it, but I’ve never felt very skilled at it. But, last year I bought an OXO Mango Splitter and I love it! If you’re challenged at cutting open mangoes, you’ll probably like it too. After you’ve sliced up your mango, you’ll cut open your sausages lengthwise, but just like the hot dog sandwiches of my youth, you won’t cut all the way through. Just enough so that you can lay them flat, but still attached, like you see in the photo below. To make my grilled cheese, I’m using an indoor grill/panini maker. I suppose that might make this a panini? Either way, it’s good stuff. The chicken sausages I bought are already cooked, but I like to grill them before using them in my sandwich, and I recommend you do the same. With your sliced mango and grilled sausages, you are ready to assemble and grill your sandwich. Split your sandwich rolls (if they aren’t already) and brush the top and bottom of the roll with olive oil. 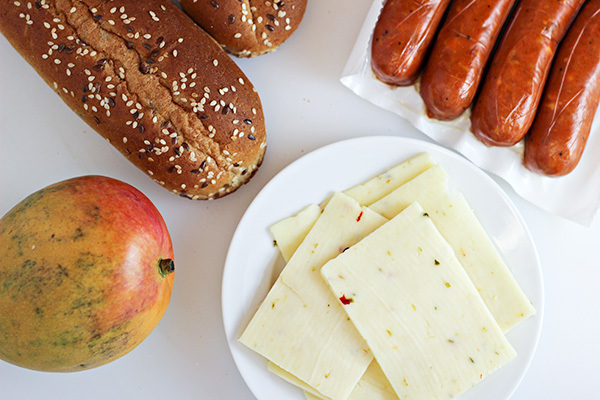 Place the bottom part of the roll on your indoor grill/panini maker and top with the following ingredients in this order: cheese, sausage, mango, and finally more cheese. 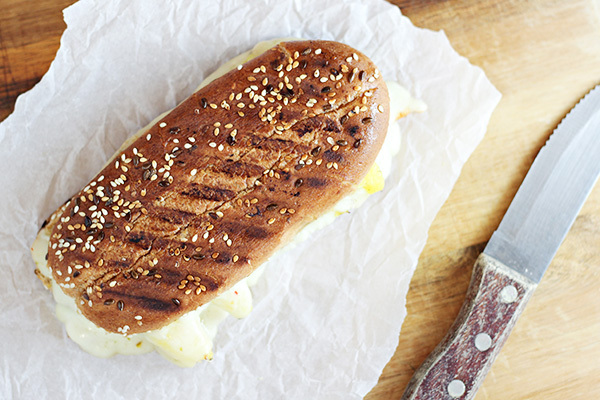 Place the top of the sandwich roll on the sandwich and cook according to manufacturer instructions of your grill until the cheese is melted and the roll is lightly browned. Remove from the indoor grill/panini maker and serve. Heat indoor grill/panini maker according to manufacturer instructions. Slice sausage in half lengthwise without cutting all the way through (just enough so sausage will open and lay flat). 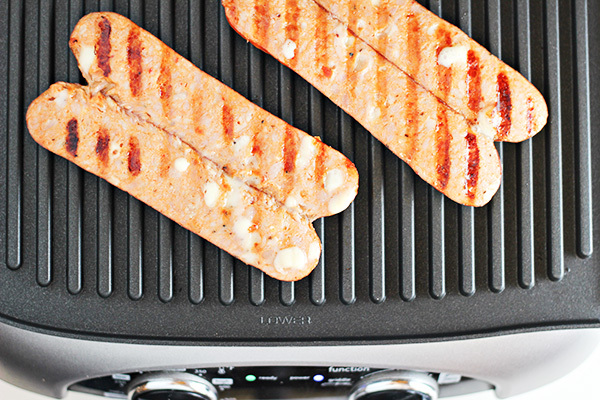 Grill sausage on panini grill until heated and grill marks appear. Brush the top and the bottom of the sandwich roll with olive oil. Place bottom sandwich roll on panini grill and immediately top bread with half of the cheese, then the sausage, followed by half of the mango slices, and finally topped with the remaining cheese. Place top of sandwich roll on top of sandwich layers. 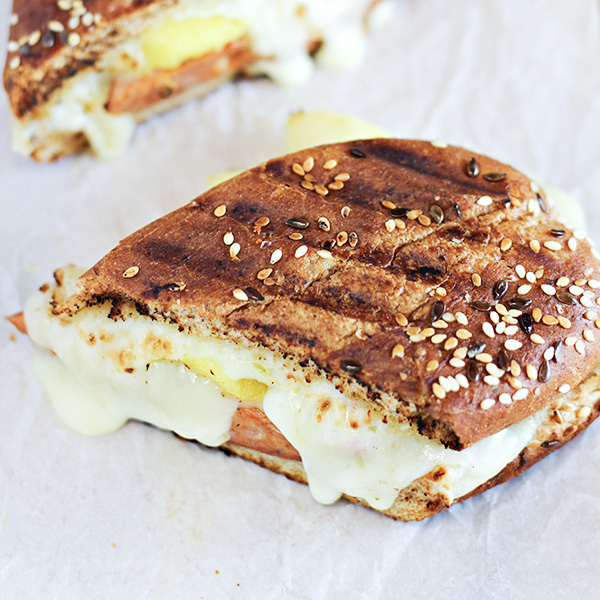 Grill sandwich until golden brown, crusty, and cheese is melted. Serve whole or cut in half. 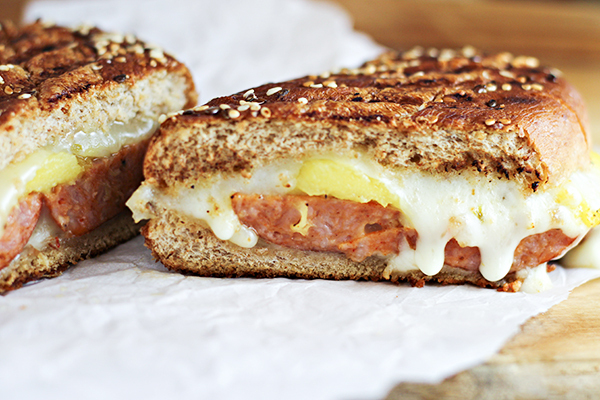 While I used a panini maker/indoor grill, you can also create this sandwich in a skillet if you wish. Follow the same instructions, however, it will be necessary to turn your sandwich over to cook the top after the bottom is golden brown. 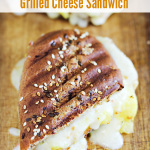 Want more gourmet grilled cheese recipes? yum! i love fancy grilled cheese! This sounds delicious! Loving all the melted cheese. Thanks for joining the Family Joy Link Party! This is such a yummy recipe can’t wait to try it out. Thank you for linking up on the #HomeMattersParty this week. Looking forward to seeing what you link up with next week. Looks great! Why have I never thought to put sausage on a grilled cheese? LOL…that’s what I kind of thought. Turns out it was perfect, specially with cutting them lengthwise. Thanks Hannah! 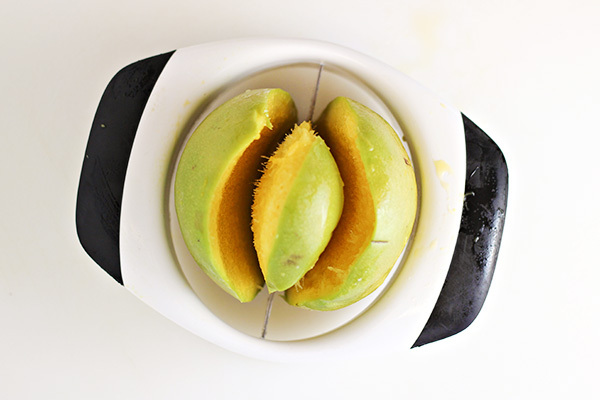 Delicious sandwich and the mango slicer is one of the best tools ever!